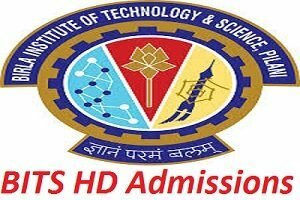 BITS HD Admission Test 2018 (बिरला इंस्टीट्यूट ऑफ टेक्नोलॉजी और साइंस हायर डिग्री परीक्षा प्रवेश): Applications for the BITS HD (Birla Institute of Technology & Science Higher Degree) Exam are now available from April 2018. Candidates Must apply for the BITS Higher Degree Admission Exam 2018 finally meeting the usual academic qualified criteria. Aspirants can analysis the particulars like as Eligibility, BITS HD Application Form process, Important Dates and more under on this page. All the necessary details concerning the BITS ME Admission Test 2018, you can follow the procedural details given below. All should make it sure that the candidates should have submitted the online application form on or before the last date, as after the last date, the online application link will be disabled. Students who want appear in BITS higher exam, then they need to fill the application form provided by BITS Institute. Aspirants must have pay attain here we provide simple instruction of BITS HD Application Form 2018 by which they can fill their application form easily. Firstly, Aspirants have to give their personal information, eligible exam details. Candidates have to select and enter 3 exam venue in the order of their choice. After acceptance of this information, students have to select the course along with the campus of their desire. A single Application Number will be accomplished on submission of the information. Students must note this number for further logins to analysis the application condition, download admits card and analysis the result etc. After submitting the online form for BITS HD, Aspirants must take 2 printouts of the same. Students must contain one with themselves for future use. The candidates must have to pay Rs. 2200 as the application charges at the time of submitting the online application form in the suitable payment mode. Payment Mode: BITS aspirants can pay their application form Online or by cash payment at preferred ICICI branches using a challan to be printed from the URL. Birla Institute of Technology & Science Institute has released the official notifications about BITS HD Exam Schedule. So we are requested to aspirants that they must download the Exam Timetable & begin to start their exam preparation regularly. Biotechnology Aspirants fundamental have capable preparation in Biochemistry and Microbiology. Communication Engineering Degree in Electrical & Electronics/ Electronics & Instrumentation or its corresponding. Design Engineering; Manufacturing Systems Engineering Degree in Mechanical Engineering or M.Sc. (Tech.) Engineering Technology of BITS or its corresponding with the specification of taking positive extra courses. Software Systems Any degree in engineering/technology with especial preceding preparation. The Admission Exam has 2 parts with 3 marks for every right answered. Negative marks of 1 mark for each wrong answer. It is a mandatory exam for candidates basis on the qualifying degree program. Aspirants who have adapted for Software systems are clear from this section. For M.E. in Software systems: A major test having 50 questions with duration of 60 Minutes will be organized. During the time of filling in the BITS HD 2018 Application Form, Aspirants have to provide 3 choices of centres from the list of the given BITS HD Exam Centres. They will be distributed 1 centre from the cities of their choice. During vacancy booking, students can advantage the information of the vacancy for the exam and dates provide as per their preferences of the BITS HD 2018 Exam Centres. The final list of the BITS HD Exam Centres will be declared only after all the forms are received and inspected. The final list of centres and the performing days at every centre will confide in on the number of applicants for BITS HD 2018 Admission Test and their choices of the BITS HD 2016 Exam Centres. BITS Higher Degree Admission test Admit card is available for loaded from May. Students have to fill their BITS HD 2018 Application No, Gender, and DOB. After loading, they have to paste a photograph and get it sustain by the Head of the institution last prepared in or a Gazetted officer. The students have to download the BITS HD Hall Ticket to appear in the exams successfully. The result has been declared on July. Aspirants must log in to analysis their BITS HD 2018 Exam Score. When the BITS HD 2018 Admission exam Result is announced in June, Students who are selected can approach and download their admission letters. Aspirants must entire their admission procedure as detailed in the admission sign after they eligible in the interview to be held for the selected students. Students have to information to the corresponding college in July and complete their document authentication and pay the admission fees. The admissions will be provided as per the exam merit scores of the students, the preferences of courses entered by them in the BITS HD 2018 Application Form in the order of their choice and their achievement in the individual interview. Any other document described in the admission letter of BITS HD 2018. The candidates who are looking to get the admission in the BITS M.Tech Classroom Courses, they are advised to appear in the BITS HD Admission Test 2018 and for it, the candidates need to submit the application form for BITS ME Admissions on or before the last date. For any type of assistance, while registering online for the BITS PG Admission Test 2018, you can contact us by commenting at the end of the post, we are assuring you that our experts will respond you as soon as possible.